Paco Cifuentes is a Spanish composer, singer-songwriter and poet. Born in Seville in 1974, he started making rock at the age of 16 influenced by bands like Deep Purple, Led Zeppelin and other groups of seventies. Later on, he became interested in becoming a singer-songwriter – a spanish cantautor – which led him to compose his own songs with guitar and voice. His musical references include Lou Reed, Tom Waits, Leonard Cohen, John Lennon, Sabina, Serrat, Radio Futura, Fito Paez, Calamaro, Caetano Veloso, Joao Gilberto, Carlos Cano, Triana and Lole and Manuel, among others. 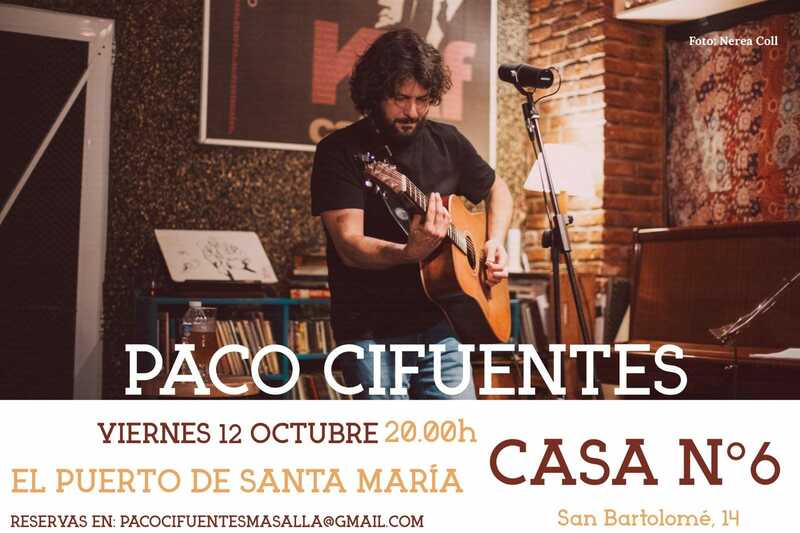 This is music to be enjoyed live – and we are proud to announce that Paco Cifuentes will be performing live in our Patio Interior on the 12th October.